It’s impossible to write a review of this book without mentioning The Hunger Games. So let me start there and then I’ll return to it later. When I heard there was a Japanese novel with roughly the same plot line as The Hunger Games, I had to read it. I mean – a Japanese author writing about kids killing each other on an island? Have you seen Japanese tv-/reality-shows? There’s no way this is not going to be good. So I got it from the library and dove right in. I read it as quickly as I could and I really enjoyed it. Most people by now have either read or seen The Hunger Games – or at least it feels that way. At least everyone know what it’s about. Battle Royale is like The Hunger Games – but with more serious weapons, more violence and more deaths. In Battle Royale, one class of 40 students is chosen to go to an island and fight it out until death. They’re drugged while driving in a bus, supposedly going on a school trip. Instead, they’re taken to a school on an island and here, they are informed that they are going to participate in the Program. To convince them that this is real, they are shown their dead teacher who tried to stand up for them and when a couple of students either protest or whisper to each other, they’re killed by the soldiers. So now, everyone grasp that this is reality. Each student has had a collar put on and are told that if they enter a forbidden zone or if there has been no killings in 24 hours, the collars will explode, killing them. They are all given a random backpack with a weapon in – weapons goes from uzis and machine guns to rusty knives and binoculars. And then the games begin. When reading this, you get to experience every death. Whenever a student dies, you are right there with them. Some students are main characters – others are just featured for a few pages before they’re killed off by one of their class mates. It’s a bloody mess, frankly, and it’s so very good. So did Suzanne Collins rip off Battle Royale when she wrote her hugely popular The Hunger Games series? There is no question about there being a lot of similarities between the two. But just because the basic idea is the same with teenagers killing each other off in order to win, and just because there are other similarities as well with some having to play the game more than once as well as some similarities in the endings, I don’t think Suzanne Collins did rip Battle Royale off. The Hunger Games is not Collins’ first book so she know how to write a novel. And I read one of her rare interviews where she talks about the inspiration for The Hunger Games. According to this, she was flipping through channels one night and saw young people competing for money on one channel and images from the Iraq war on another and these things merged in her mind and from that, she got the idea for The Hunger Games. This makes sense to me. Maybe she did know of Battle Royale when she wrote her books, maybe she didn’t. According to her, she didn’t. Either way, she certainly made the idea of teenagers fighting it out to the end her very own. She created something unique with her story and her characters and even if some of the themes are similar, the stories are different. And maybe both Suzanne Collins and Koushun Takami owe something to William Golding’s Lord of the Flies where a group of boys get stranded on an island, tries to self-govern but everything breaks down and they end up forming two groups, fighting each other. Not many deaths in this novel though. But Collins and Takami step that part way up as well as change the reason for the children being there – from it being an accident to it being a planned situation, created to cause casualties. I think both books – all three, in fact – have their own merits and I highly recommend them all. I can’t quite say if I prefer The Hunger Games or Battle Royale. I think they both have their strengths. Battle Royale is probably not suited for The Hunger Games intended readers but it’s a great, thrilling read that I thoroughly enjoyed. 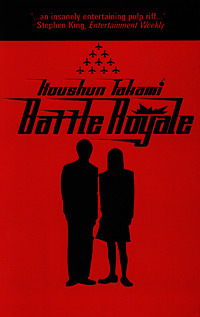 Recommended to me by novelist Kelly Braffet (Josie and Jack), Battle Royale is an insanely entertaining pulp riff that combines Survivor with World Wrestling Entertainment. Or maybe Royale is just insane. Forty-two Japanese high school kids who think they’re going on a class trip are instead dropped on an island, issued weapons ranging from machine guns to kitchen forks, and forced to fight it out until only one is left alive. Royale bears some resemblance to Richard Bachman’s The Long Walk. You probably won’t find it at your local bookstore, but you can order it online. ”No prob,” as Takami’s Springsteen-quoting teenagers are fond of saying. This entry was posted in Prizes, Reviews and tagged Battle Royale, book review, books, Koushun Takami, Lord of the Flies, reviews, Suzanne Collins, The Hunger Games, William Golding by christinasr. Bookmark the permalink.